Digital photo frames are finding their place in more and more homes. We mentioned a few of them in the 2010 Holiday Gift Guide. Both the Ceiva and Kodak frames were reviewed in detail last year. Sharp-eyed readers noticed that the Digital Foci Moments 8 was a new mention and asked for a more detailed RainyDay review. Today, we are happy to comply with a FirstLook of this full-feature photo frame. 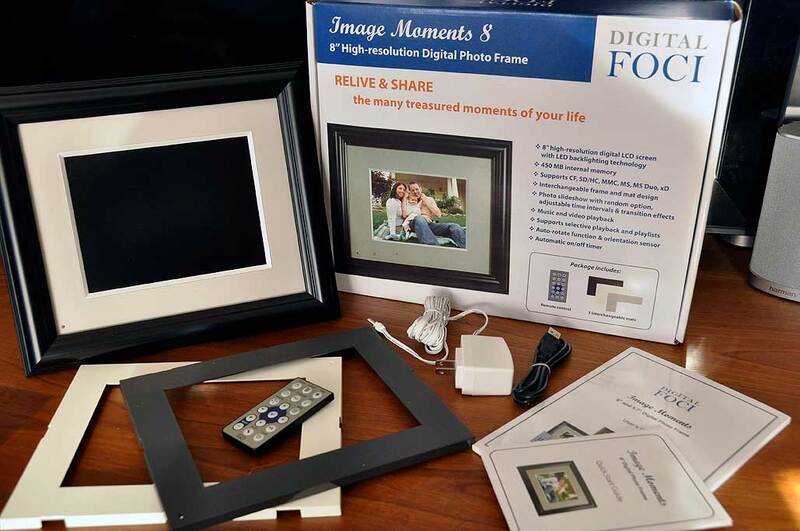 The Digital Foci Moments 8 is a high resolution (800×600) digital photo frame which also contains a pair of quality stereo speakers. It is the stereo speakers which distinguish this photo frame from the Cieva and Kodak units. While the Digital Foci Moments 8, unlike the Ceiva and Kodak photo frames, is not email-enabled, it distinguishes itself from the others with the ability to handle more than just still images. The Moment 8 frame is able to play both music and video, something which neither of the other frames can do. We’ll have more on this unique feature in our FirstUse review in the Spring. In this FirstLook review, we would like to give an overview of another interesting feature of the Moment 8, the interchangeable mat. 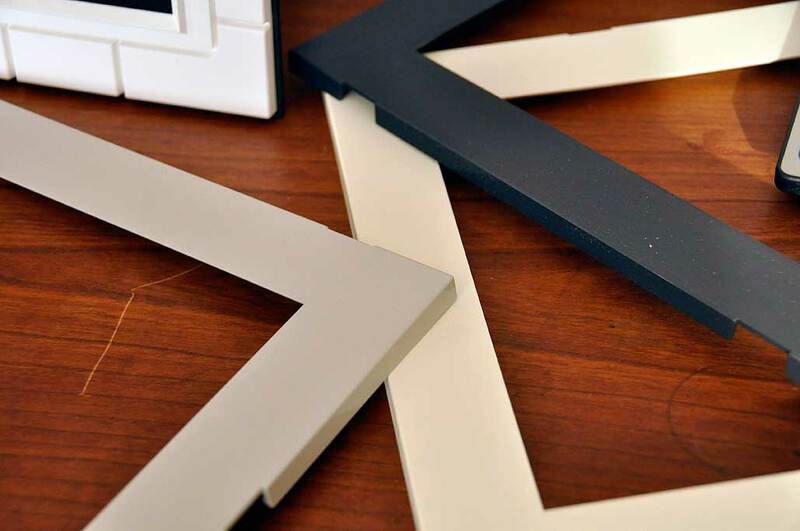 We think it is a great feature for those who like to have their interior design “just so.” It also opens up all kinds of DIY possibilities for those who like to customize the frame even further. The frame of the Moments 8 is held in place by tabs. Pressing them will release the frame from the body. The mat may be released by pressing on the catches located on the side. While the mats are made of plastic and are custom molded for this frame, we can certainly see that it would not be difficult to spray paint them to the desired color or cover them with a pattern of choice. For the really ambitious, even the wooden outer frame may be replaced with one made of more exotic wood. We had always wanted to see how difficult it would be to take a digital photo frame and give it a whole different look. The issue with the other units was that the outer frame was always tightly attached to the electronics. This Moments 8 is the first unit we have found which was designed with the ability to easily swap frames. We will attempt these projects in the coming months. The FirstUse review of this Digital Foci Moment 8 photo frame will be in the Spring iPad issue of RainyDayPhotography. We hope to update the RainyDayPhotography iPad issue four times over the course of the year. The content in the iPad issue will be more indepth and more interactive. We are excited about it and hope you will find it enjoyable. Look for it in the Spring.